If you're a scuba diver, Aruba diving is all about the wrecks. Pretty awesome! Do a Jeep tour! You totally feel like Indiana Jones riding all around on bumpy rocks and almost flying out of the jeep! Rent a car. You will need one to get to Baby Beach. 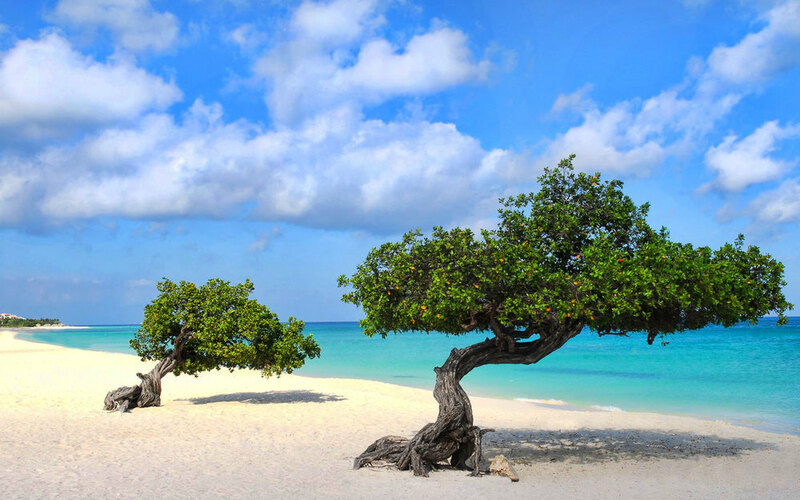 Eagle beach is where you will see the iconic Divi Divi tree. It grows sideways and points towards the ocean! If you are a flamingo fan, go to Renaissance Island. 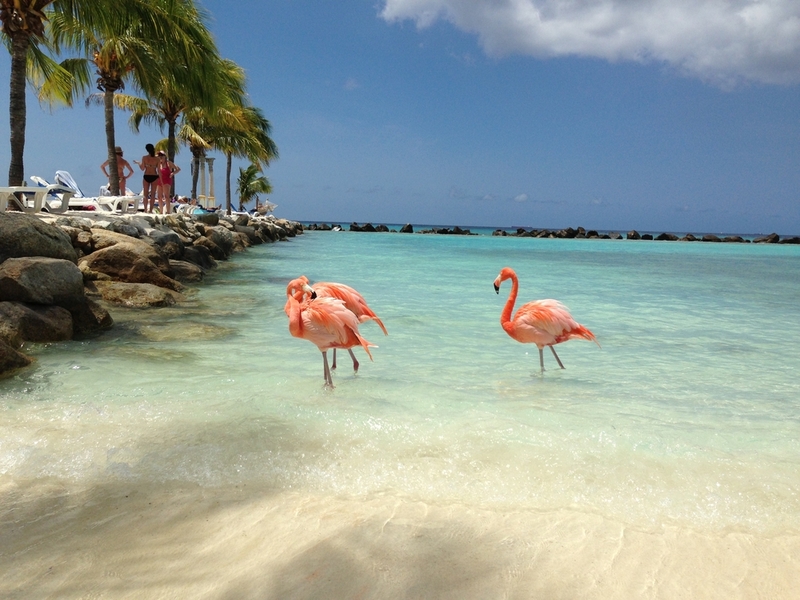 Its a private island owned by the Renaissance and you will have plenty of flamingo sightings. Bring tons of sunscreen as mostly everything you will be doing is outdoors in the sun. If you have a GoPro, bring it. Its the perfect place to use it to capture the rumble and tumble adventures as well as underwater shipwrecks. As a gift from my in laws, JP and I happily trotted down to sunny Aruba for our honeymoon as we were welcomed by perfect 82 degree weather and pristine white sand beaches. Ready to relax and swim all day, Aruba was an excellent place to decompress from wedding madness and soak in some quality time together. Located on Palm Beach along with a slew of other hotels, the Marriott was in an excellent location and had adult only sections which was great for us. We had a one bedroom suite with outdoor patio and a kitchen which overlooked the ocean. Service was very attentive to our needs and everyone including other travelers were really friendly. Sunset walks on this beach every evening became a must do for us. Plenty of water sport activities available and I stuck with paddle boarding so that I could clearly work on my abs and tan simultaneously. 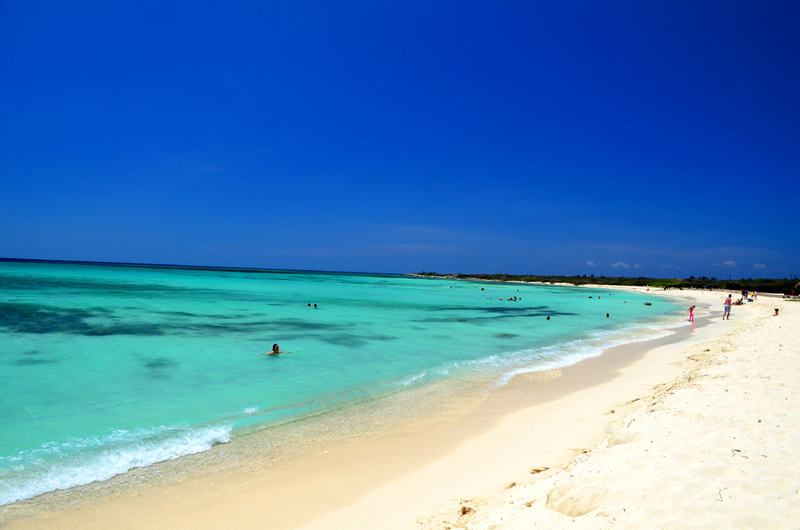 Hands down, one of the best beaches in Aruba. You need a car to get here but its worth the trip. The water is crystal clear water and shallow so you can see the fish swimming at your feet. There is a lot of seaweed however, so on a higher tide day, there might be more of it clouding the water. The beach is quiet, secluded but has rentals for chairs and cabanas. Great place to go snorkeling and swim around the little caves and rock formations. Eagle Beach boasts white sand like powdered sugar, a truly beautiful beach with a lot of natural shade. Perfect place to watch the sunset. We did a walk from Palm Beach to Eagle Beach and its an incredible walk along the coastline. Super romantic. The iconic Divi Divi tree is also on Eagle beach. I call it the leaning tree. They grow sideways pointing towards the ocean. Renaissance Island is privately owned island with crystal clear water and a white sand beach, which is about an 8-minute water taxi ride away. This beach is adult only and is also known as flamingo beach, which has a spectacular view of flamingoes walking around looking for food. The island is free for those staying at the Renaissance Hotel and for others, you need to purchase a day pass which allows you access to the island a well as towels and chairs. I think if you go once, thats all you need. I don't think I will be back, but it was definitely worth seeing once! Fun little stops on our Jeep tour. Booked the tour with our hotel at the Marriott Surf Club and had a great time! ABC Tours are great! If you have the time and haven't done this, I'd suggest it! Its fun to see the animals and take an off road tour of Aruba. Its really rocky and they drive through water and the ride gets a little rough, but its certainly an adventure and you see Aruba from a totally different standpoint. I mostly gripped the handrail the entire ride because I thought I was going to fall out of the jeep with every turn we took. Insert terrified emoji. But right here is the best ostrich moment ever! Scuba Diving in Aruba is all shipwrecks which is really cool! We went diving with Red Sail Sports and they took us to a few dive sites including Antilla Wreck and Arashi Airplane. El Gaucho: Argentinean Grill with variety of meat and fresh fish prepared in a variety of ways. Live band and funky decor. Really crowded so if you don't want to wait, you better have a reservation. Flying Fishbone: Dine with your feet in the ocean and jaw dropping background setting. Delicious seafood and excellent service. Highly suggest a reservation as its very popular and super romantic. Madame Janette: Famous for their almond crusted fish and its to die for! Excellent atmosphere, outdoor seating with string lights and live band, plenty of beers on tap. Need a reservation. I just had to post an image below of Flying Fishbone because it was such a stunning and romantic setting for dinner and cocktails. Our table was the one closest to the rock and the water came up to almost our knees when sitting down, but what a lovely experience! This trip was everything we imagined it would be. We spent quality time together, got plenty of R&R and did activities that we both enjoyed. JP loved Aruba and I am sure we will be back again soon. So many beaches to see and such little time. Until next time Aruba!